Do you know spaetzle? It is a southern German pasta specialty.They are made of flour, eggs and salt. If I remember correctly, it's 8 eggs on 2 lbs of flour. My best friend from university now owns a little restaurant in Berlin that specialises in spaetzle dishes. From what I know from my spaetzle restaurant friend, in order to make them at home, one needs a spaetzle cutter to get them into the right shape. I don't have one. I never made spaetzle myself. But I'd love to. I should get one of these spaetzle cutters while I am in Germany. It will surely be much more difficult to get these kind of kitchen utensils in Dubai. Alright, I admit this is a lazy recipe. It's lazy because I am using readymade, dry spaetzle. It's basically more about the sauce which works well with any pasta. In fact, it is our all-time favorite pasta sauce. It thrown together in less time than the pasta needs for cooking. 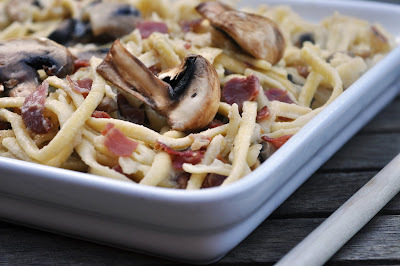 The bacon and the garlic do the main work for the flavor, the mushrooms bring the veggie freshness. I usually use just as much cream as it is needed to coat the pasta. If you like it saucier, put in more. We have this sauce with some pasta sort at least once every fortnight. You can experiment with the veggies, if you get bored of the mushrooms. Any season will have some that will work well with bacon and cream: I like it very much with spinach. I can imagine zucchinis in there too. Or asparagus. You name it. In a large pot of slightly salted boiling water, cook the spaetzle according to instructions. When spaetzle are al dente, drain. Stir the drained pasta into the sauce until all spaetzle are well coated. Transfer to serving plates and serve immediately.